Leatherhand stands just a tad under 4 inches tall, although when you factor in his tale, he is a bit over 7 inches long from tail to snout. He's sculpted hunched over, so technically he would be a bit taller. He's not a small figure, but he is small compared to other figures in the line. Scale seems to be a recurring issue in this line, and Playmates' solution seems to be simply making all figures the same size. 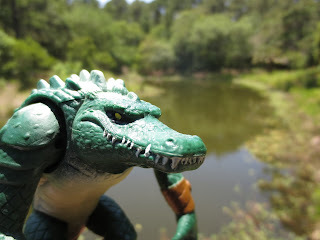 Since this is a mass-market released figure aimed more at kids than collectors, I can certainly understand the desire to have the figures all available at the same price point, although I do wonder if some kids will be disappointed that their Leatherhead doesn't tower over everyone else. While he'll fit in well with your new TMNT figures, he fits in great with vintage TMNT figures, too. 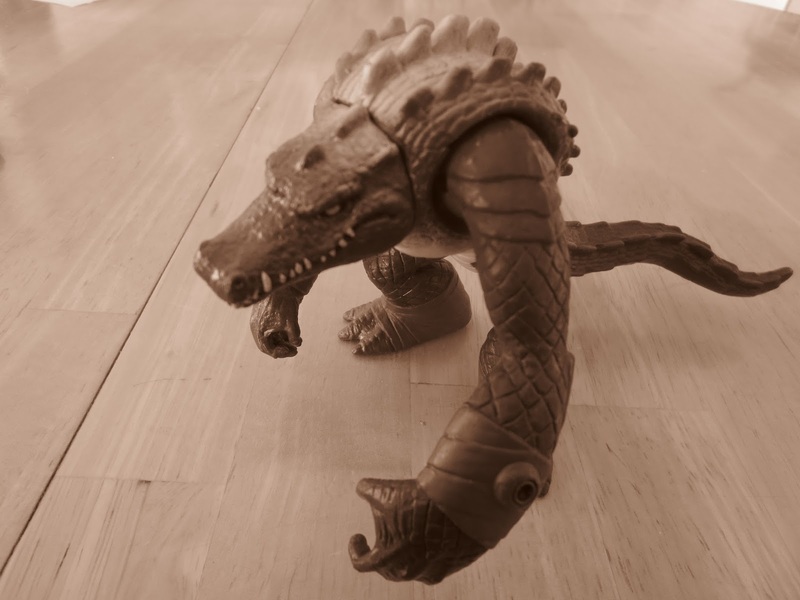 Leatherhead features ball jointed hips, a swiveling tail, ball jointed shoulders, and a swivel neck. That seems like pretty limited articulation, and for the most part it is. Still, the presence of a few ball joints does give you some posing options. He's very easy to keep standing, but a few extra joints would have went a long way towards making this a better figure. Still, he's just a little preposed, so his limited articulation still makes small movements appear somewhat dynamic. The sculpt is great, and I have no complaints about it at all. Playmates did a nice job of translating the look of the character from the cartoon (although he is a bit small, but I've discussed that already). The limbs are covered with a scaly pattern, and his back is a solid sheet of spikes, ridges, and scales. You could tenderize meat with his back (but why would you want to?). While the head looks fierce, it still manages to capture that somewhat serene look that alligators often have when they're just chilling out, waiting for some unsuspecting victim to swim by. I love the way that the tale sticks straight out with just a few little curves. The underbelly is decent and even has what looks like a scar of some kind on the left chest. Leatherhead is certainly a cool looking gator, and has enough wiggle room to fit into your collection whether you want him to be good or evil. He's even fun to pose alongside smaller action figures or minifigures, because who doesn't love a gigantic mutant alligator? Leatherhead is cast in a deep green that I happen to find very appealing. I love his colors, and further, Playmates did a nice job of adding some lighter paint to the scales on his back and a yellowish tone to his belly. It's not the greatest paint job ever, but certainly better than a lot of other mass market toy releases. The brown wraps on his ankles and wrists are clean, and the face is handled excellently. Each tooth is painted, and his eyes are nice and creepy. They're yellow and surrounded by a black circle, giving him a very unique look. The vintage Leatherhead is one of my favorite Teenage Mutant Ninja Turtles figures, and the one pictured above is my original childhood version. Not only was he a super cool action figure, but he came with some great accessories. His cool bear trap and shotgun really made the Cajun gator stand out. Perhaps that's why I regretfully inform you that other than his tale being packaged separately from his body, Leatherhead comes with no accessories. Nothing. Nada. I find that incredibly disappointing, especially considering the great accessories that so many TMNT figures have come with. Anything would have been appreciated, even a small canister of ooze, a baby alligator, or simply a weapon of some kind. Accessories really do go a long way towards making any figure feel like a better value. Despite his articulation and lack of accessories, I do like Leathehead quite a bit. I recognize that TMNT is a line targeted to kids; they're available everywhere and aren't overly expensive, so I'm not going to be too harsh to him. He really is a good figure, and that's what I'm giving him with a little addition because he is very fun and durable. Confirmed: Good and a 1/2. 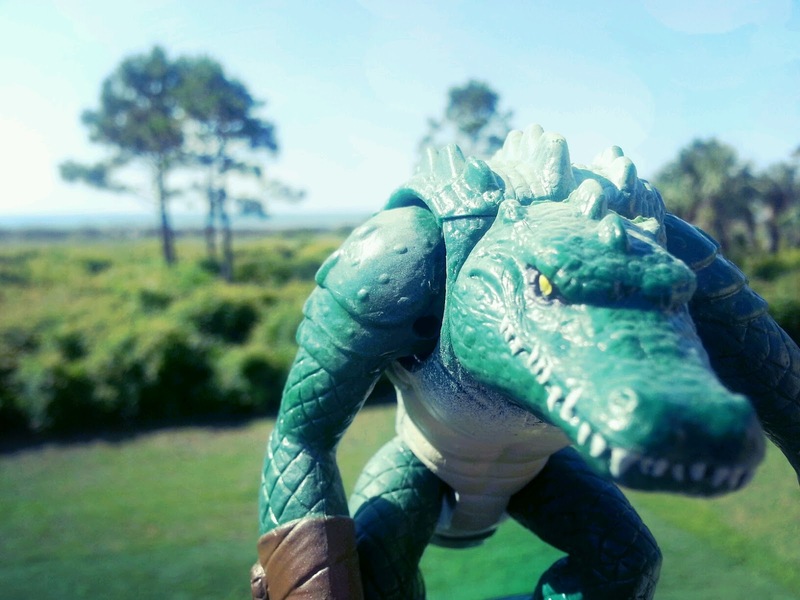 I managed to find Leatherhead on a trip to the beach while staying on an island with a fairly high alligator population, and that made him even more fun. 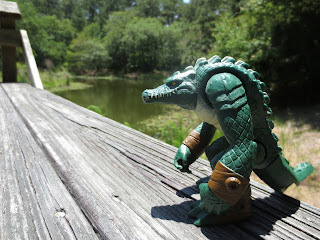 Some of the pictures used for this review were taken at a pond where I actually did see an alligator, so I'll definitely have some fond memories of this guy. He's really quite a fun action figure, all things considered. If your collection is lacking in mutant alligators, or you simply need someone to keep Mola Ram in check, pick this guy up. I've been seeing him around more frequently, so just keep your eyes peeled.  I've reviewed most of the TMNT figures on my Amazon page, but I've only reviewed two others here on ThEpic Review: Ooze Tossin' Raph and Snakeweed. They don't have Leatherhead in stock yet, but you can grab plenty of other TMNT figures from Big Bad Toy Store by clicking our banner at the top of the page. Barbecue17 wasn't born on the bayou, but he sure does love crayfish, gator tail, and a good cup of gumbo. Check out another side of Barbecue17 at his Flickr page. Great outdoor pics! 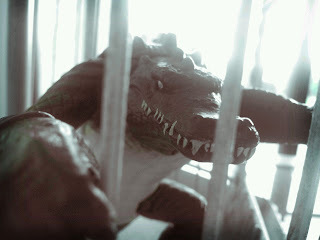 I like this one too, but also am a bigger fan of the original Leatherhead. They could have at least given this guy a vest or something. Thanks! 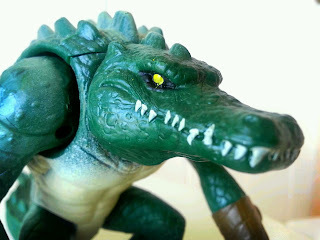 Yeah, the original Leatherhead is easily one of the best figures in the original line. Great accessories, sculpt, and a cool opening mouth. Hard figure to beat. An accessory or two definitely would have helped this guy to compete with his predecessor.